In some aspects of my life, I am a creature of extreme order and habit. You'd never know it from looking at certain places in my house (basement, I'm talking to you) but I jealously horde those tiny pieces of ritual and order that I've managed to carve out of my oftentimes chaotic life. My computer is a perfect example. Every day I have to open the programs in a specific order, beginning with my email. Email must be first, and no, I do NOT want to auto-archive my old emails. They are my babies and I have no intention of sending them to the old-email home where no one ever visits. My browser of choice is Firefox, and each tab is opened in a specific order: Blog -- RSS reader -- Gmail -- Facebook -- Twitter -- Other diversions as required. Thankfully, browser tabs can be dragged and repositioned, so if something happens and a program crashes or is mistakenly closed, it's easily fixed. There isn't the same happy ending if my prescribed task-bar caste system goes awry. Things have to be closed down and reopened in their proper order. Just as the online comics must be read after the New York times but before Huffington Post; Facebook only precedes Gmail alphabetically speaking, and never in my browser hierarchy. For the past six months (I'M SORRY) I have opened my blog and been faced with the cold, angry, accusatory stares from of a bunch of cows. I think they've been lonely. And maybe a little bored. And I've been meaning to get to it, I really have. But blah blah blah excuse excuse excuse, and here we are, together again, six months later. During that time though, even when I was swamped at work, or chipping paint of of the last God-forsaken wall in my living room, or on vacation discussing monster trucks with a preschool expert, I still opened my browser and gave my blog the lead-off spot, despite the damn cows pleading with me to do SOMETHING. ANYTHING. Too bad for the cows, they don't seem to have a Facebook page. I have been able to manage fairly regular status changes during my blog-hiatus. Let me assure you it's NOTHING profound, but if you've kept track of me through Facebook you know that I'm not dead, and I love the Internet too much to become Amish. I have a Twitter account too, though it's sadly obvious from my distinct LACK of posts that I enjoy browsing Twitter far more than I enjoy contributing anything to it myself. Maybe it's a lack of self-confidence, but if I don't care when I'm eating a burrito, I'm pretty sure nobody else does either. I was ready to kick-start things again (for the 80th time) about a month ago, and just when I was ready to tell those cows to stuff it...they were gone. Every last one of them. In fact, nearly all my images were gone. My banner. My signature. MY COWS WERE GONE. I waited a day, and then two, and nothing changed. What had I done? My cows left and took the blog with them. Maybe to a different computer where someone would do SOMETHING. I even went so far as to send an email to customer support at the website where I store my pictures. I heard nothing in response. I guess the cows got to them too. But then, just as mysteriously as they were gone, the cows (much like the cat) came back. And we're all back together again...staring at each other wondering what's coming next. 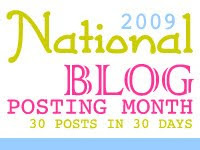 Well, coming next (which has turned to "now") Is NAtional BLOg POsting MOnth (NaBloPoMo), or "Oooo! A Pretty Button!" This is an offshoot of NAtional NOvel WRIting MOnth (NaNoWriMo) which we all know is NOT going to happen, with or without the lure of pretty buttons or the idle threats of cows. So, I'm opting for the essay, not the novel, and I'm rather excited to get back at it. In addition to the here and now, I'm going to spend time this month doing some remembering, because there are some great stories that have not yet been told. So, for those of you who have periodically checked every now and again to see if I've posted, thank you. For those of you who asked loudly when I might DO SOMETHING, thank you. For those of you who wondered and decided to wait quietly until I decided to DO SOMETHING, thank you. For those of you who aren't familiar with me and my cast of characters, welcome. At The Tuna News, there's something here for everybody. There's even a cow. Or nine. **FLINK (n.) -- A group of twelve or more cows. I am so glad to know that someone else shares my peculiarity when it comes to programs being opened in order. Mine: Outlook e-mail first, then Photoshop, then InDesign, then internet. (Unfortunately no Firefox at work - the IT overlords will not give it to me). It's about freakin time! I was almost getting to a point where I was going to have to take you out of my favorites! I had been checking back every few weeks and seeing nothing I was sad. I decided to check you again today and if still no post I was thinking how sad I'd be if I removed you from my favorites. I'm so happy to see you are back and writing again! I've got a lot of posts to look through now! So much for work!